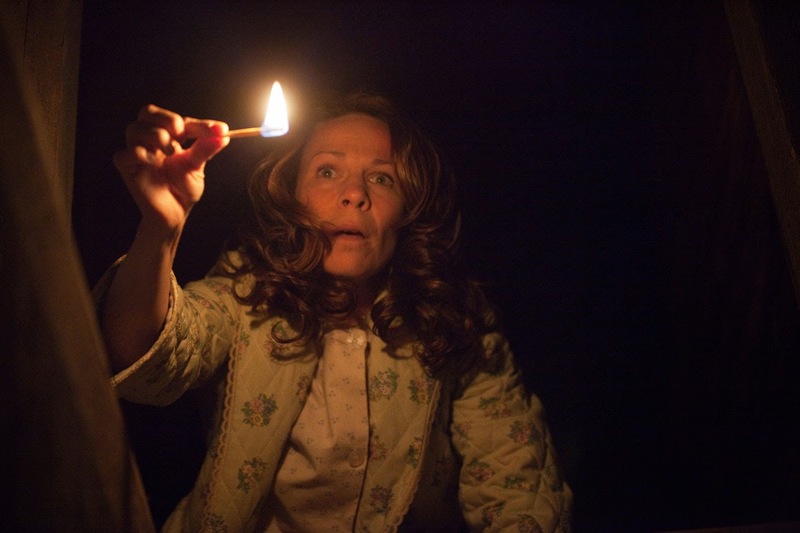 The Conjuring (2013) is a horror film directed by James Wan who directed the first "Saw." Some teenagers encounter a creepy doll, which turns out to have a demon in it. Ed and Lorraine Warren, famous ghost hunters, manage to free the teens from the creepy doll, which is then stored in the Warrens' collection of occult artifacts. A few years later, the Perron family moves into an old farm house in Rhode Island. Soon the mother, Carolyn Perron, is waking up with strange marks on her, the youngest sleepwalks to a cabinet and another younger one begins feeling her feet being pulled at. These things are brought into more dangerous territory when the family's dog is killed. The film creates suspenseful and horrific moments. The clapping scenes are fantastic and make this film worth watching. There's also a great scene when one of the younger girls sees something behind the door that no one else, including the audience, can see. The tension built up by these scenes is great and few sightings of the ghosts during the first hour helps draw the viewer in. Then comes the full reveal of the ghost and perhaps the most unintentionally hilarious moment of the movie. The witch appears crouching atop a cabinet and then jumps onto one of the older daughters. This begins the free reign silliness that pervades the second half of the film. Lorraine Warren is a psychic who hunts demons wither her husband. She has suffered a terrible shock during a previous exorcism, which makes her husband more wary about future encounters with ghosts and demons. She is a competent, strong woman, something rare in a horror film, who cannot turn away from someone in need. However, her eagerness to help soon hits too close to home when her daughter is drawn onto the metaphysical battleground. Ed Warren is a confident, charismatic man who cares most for his wife and family. This doesn't stop him from helping others, but makes him much more reticent than his wife. His big challenge comes when takes on the spirit himself. Carolyn Perron is the main person that the witch focuses on. As the mother figure, she remains incredibly strong until the end, when the force finally catches up with her. With a second strong female character in the mix, it is easy to see why so many found this film intriguing. The rest of the Perron Family isn't quite as present, but all of them are well acted. This is especially impressive considering the children in this film create some of the best parts. The Witch is ultimately more commonplace and much less terrifying than its initial premise suggested. The more the audience sees of it, the less terrifying it becomes. It just ends up being too cliched and silly to have much impact. The house and its surroundings make a great backdrop for the horror story. The creepy basement and have been done before, but they are well integrated into this film. Not as much happened as I would have liked. The force proves surprisingly nonsensical in its final battle against the Warrens. Oh, and don't expect much out of the creepy doll; you'll be much more content. There is also a reference to The Amityville Horror at the end, which is another case the real life Warrens took up. I stuck to mostly positives above, but this film also has quite a few failings. Anytime text on screen it proves superfluous and only serves to wash away the built up tension. I suppose the text was meant as an homage to classic horror films, but it isn't effective. Terrible writing also plagues this film. The sheer amount of cliches and awkward phrasing leave even the stellar acting cast struggling to make it believable. I think the biggest issue I had was with its nonsensical horror title: seriously, what was conjured? The film is worth a watch even as many of the positives also have contrasting negatives. It is kind of sad that even an average horror film with some competent direction and acting rises to critical acclaim these days. Also, check out DC's review as his 31 Nights of Macabre Movies begins!